PEABODY, Mass., April 3, 2018 /Christian Newswire/ -- Redeeming Ruth by Meadow Rue Merrill has been selected to receive a Christopher Award in the Books for Adults category at the 69th annual Christopher Awards ceremony. The Award will be presented to author Meadow Rue Merrill on Thursday May 17, 2018, in New York City at the Mutual of America Building. 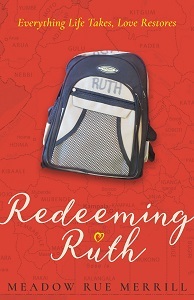 Redeeming Ruth: Everything Life Takes, Love Restores is the inspirational, true story of adoption, grief, and selfless love. When Merrill met her, Ruth was a sixteen-month-old child some church friends were hosting from an orphanage in Uganda. She had cerebral palsy and was so weak she couldn't lift her head. Part family drama, part travel adventure, and part memoir, Redeeming Ruth is the riveting, against-all-odds story of the most unlikely pairing of a small-town New England family and their adventure in adopting Ruth. Honest, raw, and illuminating, this book explores what happens when we sacrificially reach out and share God's love with others. Merrill joins the ranks of past winners including David McCullough (John Adams), Eric Metaxas (Bonhoeffer: Pastor, Martyr, Prophet, Spy), Laura Hillenbrand (Unbroken: A World War II Story of Survival, Resilience, and Redemption), and others. The mission of The Christopher Award is to encourage people of all ages, and from all walks of life, to use their God-given talents to make a positive difference in the world. Since 1949, the Christopher Awards have annually saluted media (TV programming, feature films, books for adults and children) that affirm the highest values of the human spirit and reflect the Christopher motto, "It's better to light one candle than to curse the darkness." Meadow Rue Merrill is an award-winning journalist and the author of the inspirational memoir Redeeming Ruth: Everything Life Takes, Love Restores (Hendrickson Publishers, May 2017). She has worked as a reporter for The Times Record, a daily newspaper in Brunswick, Maine, The Boston Globe, and Down East magazine. Merrill has published parenting essays in The New York Times, written for Harvard University, and contributed feature articles to The Boston Sunday Globe Magazine. She also regularly writes about faith for The Portland Press Herald, Maine's largest newspaper. The Christmas Cradle, the first volume of her forthcoming Lantern Hill Farm picture-book series, releases with RoseKidz publishers this fall. Visit her website meadowrue.com/.